При монастыре св. Антония в немецком городе Изенгейме близ Страсбурга (Эльзас, Германия; позднее Эльзас отошёл к Франции), для церкви которого сделан этот иконостас, была богадельня. Здесь монахи ухаживали за умиравшими от чумы во время эпидемии. Может быть, поэтому автор так экзальтированно, с таким напряжением передаёт страдания Христа, Его истерзанное тело и искажённое мукой лицо. Сцена Распятия заставляет вспомнить слова евангелиста Марка: "В шестом часу наступила тьма по всей земле и продолжалась до часа девятого". The Isenheim Altarpiece was executed for the hospital chapel of St Anthony's monastery in Isenheim in Alsace, which explains the presence of the plague saint, St Sebastian, and the patrons of the more austere and solitary forms of monasticism, St Antony Abbot and St Paul the Hermit. The altarpiece is now at a nearby town. The work of Grunewald expresses the torment of the early 16th century more fully than that of any other artist. 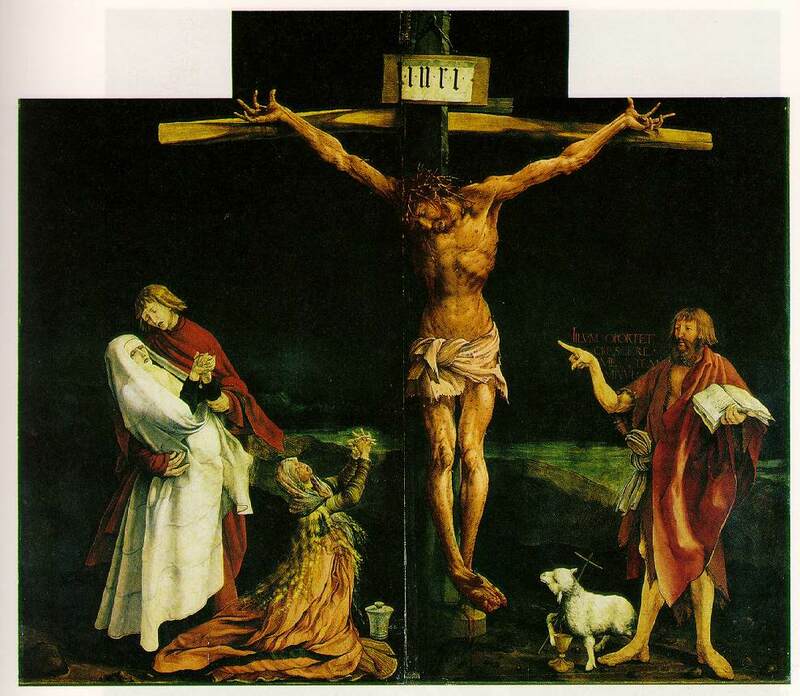 Durer was too steeped in Italian culture to have much use for the tortured Gothic forms which Grunewald twisted to suit his expressive purposes in his masterpiece, the Isenheim Altar. This was painted before Luther nailed his theses to the door of Wittenberg Cathedral in 1517, but it is painted by a man who, like Bosch, used his great technical powers to express a simple, unmistakable message of emotional intensity and terrible realism. These visions are entirely in the spirit of St Bridget of Sweden, whose Revelations were one of the most popular devotional books of the 14th and 15th centuries; they would have been repugnant to all but a very small number of Italians, of whom Savonarola would certainly have been one, and Botticelli might well have been another. The first, with the wings closed, is a Crucifixion showing a harrowingly detailed, twisted, and bloody figure of Christ on the cross in the center flanked, on the left, by the mourning Virgin being comforted by John the Apostle, and Mary Magdalene kneeling with hands clasped in prayer, and, on the right, by a standing John the Baptist pointing to the dying Saviour. At the feet of the Baptist is a lamb holding a cross, symbol of the "Lamb of God" slaughtered for man's sins. Art for Grunewald did not consist in the search for the hidden laws of beauty - for him it could have only one aim, the aim of all religious art in the Middle Ages - that of providing a sermon in pictures, of proclaiming the sacred truths as taught by the Church. The central panel of the Isenheim altarpiece shows that he sacrificed all other considerations to this one overriding aim. Of beauty, as the Italian artists saw it, there is none in the stark and cruel picture of the crucified Saviour. Christ's dying body is distorted by the torture of the cross; the thorns of the scourges stick in the festering wounds which cover the whole figure. The dark red blood forms a glaring contrast to the sickly green of the flesh. By His features and the impressive gesture of His hands, the Man of Sorrows speaks to us of the meaning of His Calvary. His suffering is reflected in the traditional group of Mary, in the garb of a widow, fainting in the arms of St John the Evangelist, to whose care the Lord has commended her, and in the smaller figure of St Mary Magdalene with her vessel of ointments, wringing her hands in sorrow. On the other side of the Cross, there stands the powerful figure of St John the Baptist with the ancient symbol of the lamb carrying the cross and pouring out its blood into the chalice of the Holy Communion. With a stern and commanding gesture he points towards the Saviour, and over him are written the words that he speaks: "Illum oportet crescere, me autem minuere" ('He must increase, but I must decrease')[John 3:30]. There is little doubt that the artist wanted the beholder of the altar to meditate on these words, which he emphasized so strongly by the pointing hand of St John the Baptist. Perhaps he even wanted us to see how Christ must grow and we diminish. For in this picture, in which reality seems to be depicted in all its unmitigated horror, there is one unreal and fantastic trait: the figures differ greatly in size. We need only compare the hands of St Mary Magdalene under the Cross with those of Christ to become fully aware of the astonishing difference in their dimensions. It is clear that in these matters Grunewald rejected the rules of modern art as it had developed since the Renaissance, and that he deliberately returned to the principles of medieval and primitive painters, who varied the size of their figures according to their importance in the picture. Just as he had sacrificed the pleasing kind of beauty for the sake of the spiritual lesson of the altar, he also disregarded the new demand for correct proportions, since this helped him to express the mystic truth of the words of St John. Облечённый могуществом ангел почти насильно врывается в тихие, пронизанные светом девичьи покои. This panel, also known as "Concert of Angels and Mary in Glory", is the central panel of the second view of the Isenheim Altarpiece. In the iconography relating to Mary, the concert of angels can accompany the Glorification as well as the Nativity. The musician angels are crowded into the Gothic chapel which fills the left half of the painting. In fact only three of them have instruments in their hands, and only one of them stands out, a blond-haired angel dressed in pale violet robe kneeling and playing the viola da gamba. His exalted expression and his beautiful instrument, however, fill the entire picture with music. The peculiar position of his hand, the way he holds the bow at the wrong end, is certainly not in accordance with contemporary practice; it is merely a compositional solution employed by the master. Behind him we can see one of his mates playing the viola da braccio, and on the left, behind the column, another bird-like, feather-covered angel who also plays the viola da gamba. Grunewald no longer makes the distinction between the nine orders of angels, but refers to their former hierarchy by depicting them as different. A long-haired female figure, wearing a crown and surrounded by a halo, appears in the doorway of the chapel. She is perhaps a female saint or, according to more recent interpretations, Mary herself before giving birth. The crystal jug on the steps symbolizes her, and the tub and towel refer to the bath to be given the newborn. Mary, lovingly embracing her child, occupies the right half of the painting. She is flooded with heavenly light originating from God the Father, in which angels flutter around. In the rear on the right we can see the two angels bearing the news to the shepherds. The garden in which Mary sits is a walled-in "hortus conclusus" (enclosed garden) with closed gates. The plants - the rose and the Tree of the Knowledge, the fig tree - also symbolizes Mary. The innermost panels flanks a carved wooden shrine to St Anthony. The Isenheim Altar is a complicated structure with four layers of painted surfaces - that is, two sets of folding wings, like a double cupboard, enclosing the final altarpiece, which consists of three carved wood statues of saints. There are also two side panels and a predella. In form, therefore, it harks back to the type of Burgundian and German carved altar of which the Broederlam at Dijon is a classic example.